"I think it's likely that they're focusing on extending the format horizontally [supplementing existing T2/T3 decks]" This is my hope. The 2 spoilers we've seen so far seem made for BW Tokens which fits right into the T2/T3 realm. Sure they're playable elsewhere but BW tokens seems to get the most out of both cards. I worry that they will pull a Masters 25 move and print a powerhouse like Force of Will to give a recognizable "face" to the set. 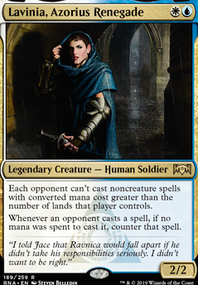 That being said, we have pseudo counterspell in standard offering tribal support in the process. FoW in standard breaks the NWO by having a free counter spell causing serious bad feels for newer players. 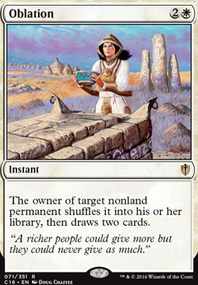 Modern is growing faster and faster every year. The T4 format is no longer. Having FoW in the format could remedy that to some degree. 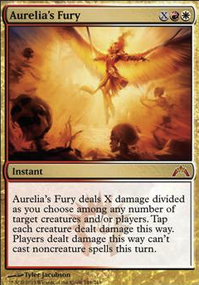 It's not as necessary as it is in Legacy, not yet anyway, but it could be a solid check valve in Modern to keep T1/T2 shenanigans at a minimum. SynergyBuild has a good point about printing dud Rares into Standard. 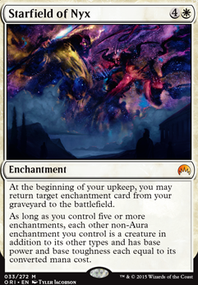 Reprints that do nothing in standard are printed at common or not printed at all. The first is specifically to appease the community's need for reprints. Simple to explain, not a huge revelation. The second is for limited playing. 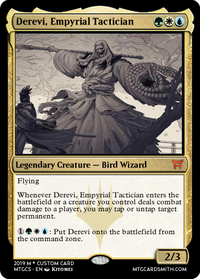 Powerhouse uncommon reprints like Swords or even a Force Spike could just occur to make playing limited more enticing. How many times do you get to play Force Spike in a draft? The last is to sell product without hoping their cards are too backbreaking. If they want to reprint legacy staples, to lower prices, they can, however I'd imagine someone in Finance at Hasboro knows it won't affect sales of the product that much. The big thing is that if they are scared of ruining modern, which if the power level of the new cards is too high they might, having safe cards they have designed prior would be in their best interest. It is a safe option, not something I have seen them do a lot of, but not something they haven't done or won't continue to. 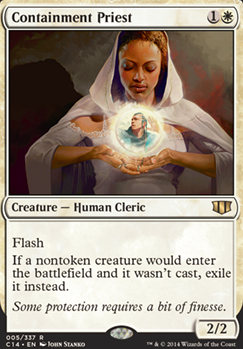 Also, for your theory on them printing Containment Priest into standard, there are only so many cards like Scapeshift or Crucible of Worlds they can fit. Those cards for the eternal formats that don't affect standard have an issue. They don't affect standard. They can't make 30% of a standard set's rare slots have no effect on standard AND not have flavor that goes with the set, so they only can fit ~5 cards for eternal formats max per set. Often 3 or less. I just don't see that occurring often. Hope I could change your mind a bit. This is really interesting to chat about so I am glad you asked the community! So apparently a lot of people are assuming that we'll get cards like Force of Will , Counterspell , Daze , Wasteland or Containment Priest and my personal thought is there is no way in hell. Let me start off with a couple of premises that I will base my reasoning on. 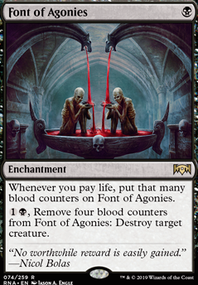 My first assumption is that reprints will require the disability to be reprinted in Standard for whatever reason (or at the very least be rather unlikely to be reprinted). Secondly, they will not reprint any cards that will potentially speed up the format or otherwise increase the overall power level. And last but not least, I think it's likely that they're focusing on extending the format horizontally (no pun intended, but interesting coincidence), supplementing existing T2/T3 decks, rather than printing cards that could potentially push existing decks over the top aka vertical progress of the format. I do believe that we'll get at least one counterspell, but it will be more in the Force Spike area (we already have Mana Tithe for example). RND is not a fan of "free" spells anymore, and I believe they don't want an extended bluffing component in the format. I heard a lot of voices saying FoW wouldn't have much impact on Modern because there aren't a lot of unfair decks, but by that metric they might as well reprint it in Standard. The actual Counterspell would push Modern in a direction where permission would be unconditional, and that would be vertical progress. Containment Priest is also one of those cards that would be rather weak in Standard, so why waste a slot on it when it could go in basically every set? What I do think will happen is that we'll get a couple of themes that will consist in part of existing (keyworded) mechanics which won't be reprinted in Standard, supplemented by new cards with those mechanics. Also tribal support in the same way. There will be little to no powerhouse card reprints whatsoever. Why? Because people can buy the old cards from the secondary market. Therefore, in order to actually sell the product, the juicy cards on the stronger side will most certainly be new cards, so people must actually open the packs to get them. Hey I have a similar deck ( here ) and was wondering what you think? 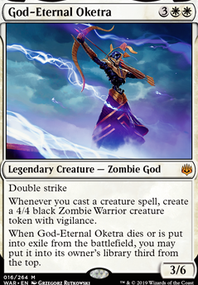 You gave me some great ideas like Trade Routes , Teferi's Response , Tragic Arrogance . I'm concerned about two things for our decks: wincons and stax. Torpor Orb , Rest in Peace , Overburden , Embargo , Containment Priest , etc are removal in a sense, but control decks like to respond and be reactive instead of proactive. What's your opinion on that, and what kind of non-infinite combo wincon would be good for UB? I've been considering Redeem the Lost , Research the Deep , and Pulse of the Grid as a redundant View from Above but they seem mediocre.